Back strap Tank Top comes in Adult ladies and youth sizes. Can be customized with your logo! Scoop front tank top features striking horizontal back straps with racerback detail. Back straps tacked down to stay in place. 4-way stretch for ease of movement. 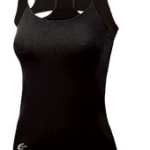 Child sizes feature full front liner; adult sizes have full shelf bra for added support. Imported.